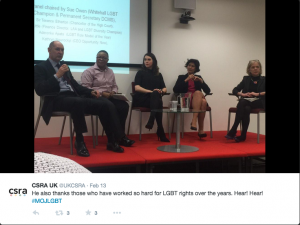 ‘Celebrating our past, proud of the present, shaping the future’ was the title of a recent MoJ event to mark LGBT History Month. The event highlighted the importance of a workplace where it was possible for staff to be themselves and thrive regardless of sexual orientation. A full house of staff from across government heard keynote speaker, Lord Browne of Madingley give an engaging insight into his own experience, and why it was important to be “your authentic self at work, whether you’re lesbian, gay, bisexual, transgender or straight” if you can. 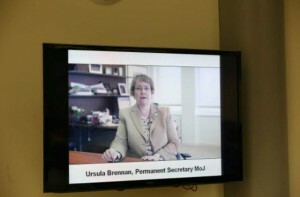 MoJ Diversity Champion Ann Beasley, emphasised the importance of building a diverse and inclusive organisation for delivering our business successfully and creating an environment where all talented staff from any background could thrive, whilst Permanent Secretary, Ursula Brennan, in a video message from Scandinavia, emphasised that good and effective leaders are inclusive leaders. The important role that ‘straight allies’ can play in changing organisational culture, was highlighted by Antonia Romeo, supporting the MoJ LGBT Champion Sam Evans’ and staff networks’ initiative for everyone to get involved in supporting a gay friendly environment and challenging inappropriate behaviour or comments when they arise. A fascinating history of the legislation by LGBT Champion Cat Little, highlighted MoJ’s constructive involvement over the years, not least in the Royal pardon granted posthumously to Alan Turing. Sue Owen, Permanent Secretary at DCMS, and Whitehall LGBT Champion chaired a Q&A on authenticity in the workplace and the importance of positive role models. The experiences of the panelists - Sir Terence Etherton (Chancellor of the High Court), Kathryn Nawrockyi (CEO Opportunity Now), Cat Little and Aderonke Apata (LGBT Role Model Award winner) - ranged widely, reflecting both the positive progress experienced in recent years in the UK and elsewhere, but also, in contrast, the continuing serious consequences of being gay or of not reporting gay friends or family members to the authorities in some other countries. MoJ LGBT Staff Networks (Spirit and Galips), along with a:Gender, and the Civil Service Rainbow Alliance talked about their work and the support they can provide. Strong staff networks are part of creating an inclusive workplace and all staff (gay or straight) are very welcome to join. Closing the event Prison Service staff talked about their work on LGBT issues in prisons and in particular the award winning work with transgender prisoners at HMP Isle of Wight. It was a great event and if you have any questions or are interested in joining one of the LGB&T networks, please use the links above.